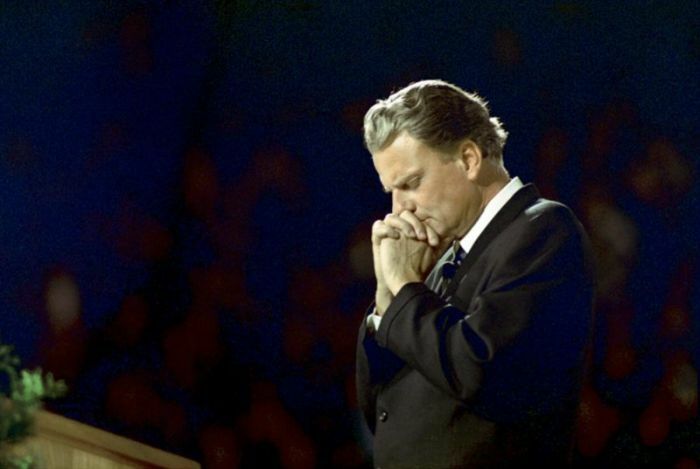 The last will and testament of famous evangelist Billy Graham, who died at the age of 99 in February, has been released to the public. In it, Graham calls his wife, Ruth, the "greatest Christian" he ever knew, and urges his family to uphold Jesus Christ no matter the cost. WSOCTV.com shared a copy of the 16-page document on Friday, which begins with Graham describing in his own words how he found "joy and peace" in believing in God since he was a teenager. "I ask my children and grandchildren to maintain and defend at all hazards at any cost of personal sacrifice the blessed doctrine of complete Atonement for sin through the blood of the Lord Jesus Christ once offered, and through that alone. I urge all of you to walk with the Lord in a life of separation from the world and to keep eternal values in view," he states. The evangelist urges his family to read the Bible on a daily basis and to trust in Jesus Christ as the means to salvation. Graham reflects that life on earth is short, and recalls his first date with Ruth in December 1940, less than three years before they were married. "Because of Christ, your mother and I enjoyed a wonderful, thrilling, and joyous life together," he adds, noting that like any couple, they also went through problems and burdens. "I want to thank her for her years of devotion, love, faithfulness and sacrifice. Of all the people I have ever known, she was the greatest Christian," he declares. Graham goes on to tell his family that 10 percent of his residuary estate will "go the Lord's work," as he and Ruth decided from the start of their marriage that they would be tithers. He states that he and Ruth decided not to be "preoccupied with material things," which, he notes, the Bible calls idolatry. "I had very little in my early life to call my own — and in the first years of our marriage we had very little to live on. We never dreamed that we would be given so much. We have tried to use our material blessings for the glory of God. We have always tried to keep a somewhat detached attitude from them. We never wanted our roots to be very deep in this world," he says. "Yet I must confess that we were always faced with a certain dilemma as to how high a standard of living to maintain as servants of the Lord. We feel that we have maintained a proper balance over the years. "Whether I have handled things properly or not, we will have to await the judgement at the Judgement Seat of Christ when all things will be revealed." "I have done my best before the Lord and I have confidence in all of you that you will consider that you are only trustees of what I have left." The rest of the document delves into the legal aspects of the evangelist's will. The verse reads, "Jesus answered, 'I am the way and the truth and the life. No one comes to the Father except through me.'"